Location: On the west side of an unnamed footpath, approximately a ¼ of a mile to the east of the A6, Buxton Road. Notes: Hazel Grove’s Midland Station was situated on the Midland Railway’s (MR) New Mills to Heaton Mersey line which formed part of its main line between Manchester Central and Ambergate. line from Hyde to the London North Western Railway (LNWR) terminus at Manchester London Road. Although the MR and MSLR had an amicable relationship the same could not be said with regards to the MR and the LNWR. Through partnership and take over the MR was able to establish a route into Manchester Central Station from the 1st January 1880. Manchester Central was a Cheshire Lines Committee (CLC) station and the MR was held a third of the shares in the CLC. The other two shares were held by the MSLR and the Great Northern Railway (GNR) who each also held a third shares of the CLC. The MR route to Manchester Central ran from New Mills to Manchester Central via the CLC Woodley to Glazebrook line which ran through Stockport Tiviot Dale. To the west of Stockport trains turned north onto the MRs own Manchester South District Line which passed through Heaton Mersey and Didsbury. Although Stockport provided many passengers the route was not direct and with lots of junctions it was quite slow. The solution was to build a direct line between New Mills and Heaton Mersey for a cost of £2 Million. The new line would allow fast express services to substantially improve journey times for trains running between London St Pancras and Manchester and between the capital and Liverpool. The new line was authorised in 1898 and work began immediately. Despite the need for some very heavy engineering, including the construction of a two mile long tunnel at Disley, the New Mills South to Heaton Mersey Junction line was opened in stages, Heaton Mersey Junction to Cheadle Heath for passenger traffic (including Cheadle Heath station) on 1st October 1901 and goods traffic on 4th May 1902. New Mills South Junction to Cheadle Heath including Hazel Grove station opened for passenger traffic on 1st July 1902. Hazel Grove MR Station was provided with one island platform which provided two platform faces. The platform was reached by means of a subway and the station was provided with a single storey building that provided the usual facilities. The station had a limited service, which changed over the years. It was not very convenient for passengers being some distance from most houses and businesses. The town had a much more convenient LNWR station on that company's Stockport to Buxton line. During the Great War the station was closed as an economy measure on the 1st January 1917. It never re-opened. After closure the buildings were demolished but the platform remained in situ for many years. While the line remained open for passenger traffic until May 1969, the London and Nottingham to Manchester Central expresses were diverted into Piccadilly (via Marple) from 1st January 1968. After that date and up until 1986 the New Mills to Heaton Mersey line was only used by freight trains. 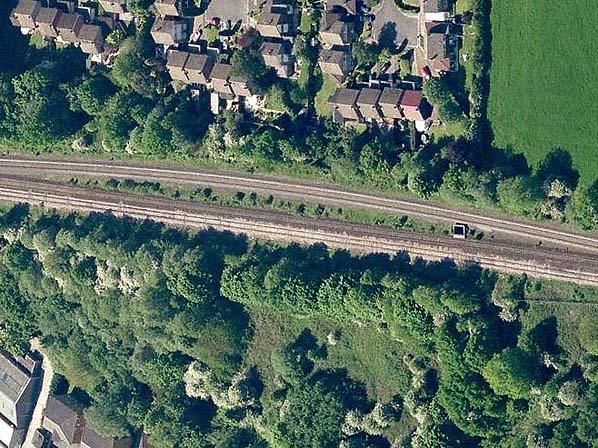 In May 1986 a link, the Hazel Grove Chord, in the form of a single track spur was opened from a point just to the west of Hazel Grove’s Midland station to a point just to the south of Hazel Grove’s former LNWR Station. The Hazel Grove Chord allowed express trains from Manchester Piccadilly to Sheffield to run via Stockport. New life was brought to the southern end of the New Mills to Heaton Mersey line. Going westwards from Hazel Grove however the line was singled and now forms a link to Northenden Junction which is only used by freight trains. Ticket from Glynn Waite, route map drawn by Alan Young, additional source Glynn Waite. 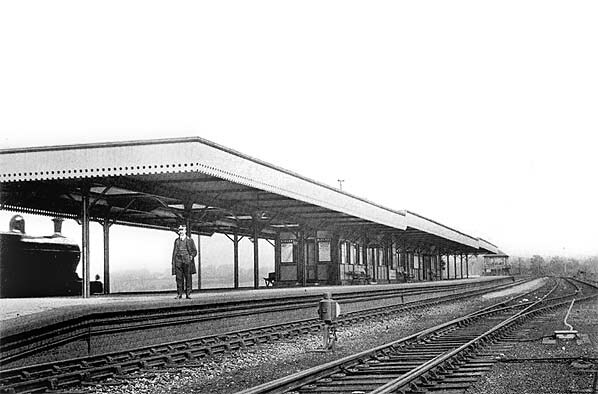 Looking east at Hazel Grove's Midland Station in 1907. The single island platform is clearly shown. At the far end of the platform can be seen a typical Midland Railway Signalbox which survived into the 1980s. This 1910 map clearly shows an access path to the west of the platform running between the tracks. This presumably led to a subway to the south side of the embankment for passenger access. There is no evidence of this subway today. 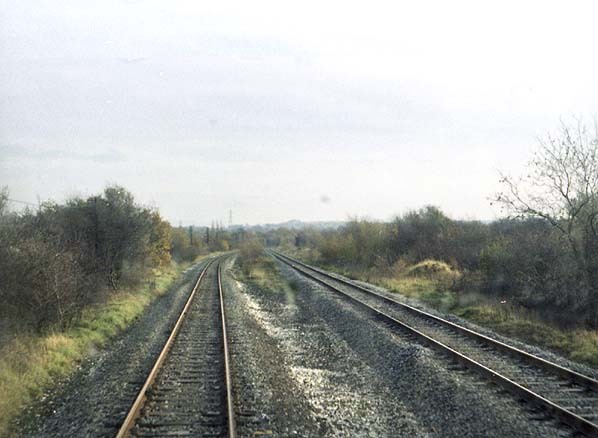 Looking east at the site of Hazel Grove Station in March 1975. 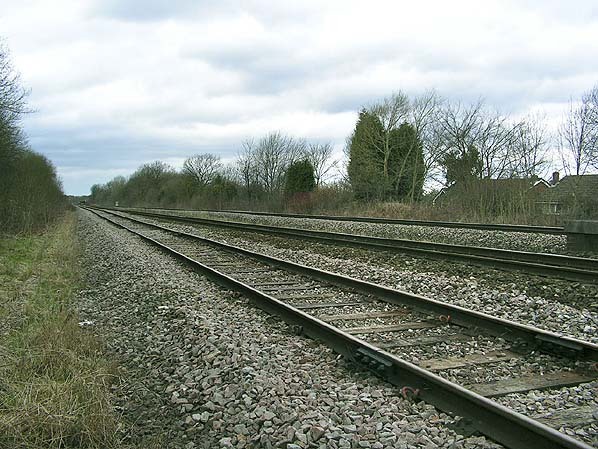 The site of the station's single island platform can clearly be seen as the double track railway tracks separate at this point and the platform was located in the space between. The Midland Railway signalbox, still in use at this date, was at the east end of the platform. This is a very similar viewpoint to the 1907 picture above. was operated by a DMU. Looking west at the site of Hazel Grove station in April 2010. The brickwork on the far right is a light shaft in the roof of the subway to the east of the station. east of the station; it has no connection with the station. The signal box was to the left of it.